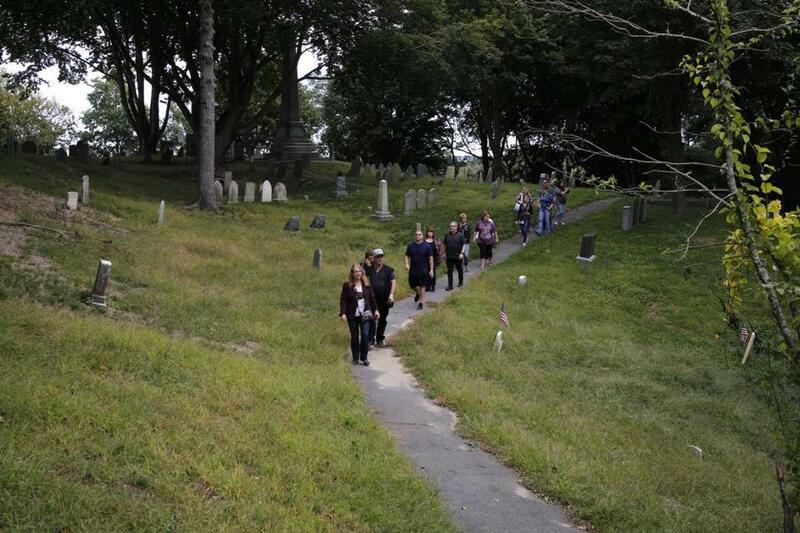 Vicki Noel Harrington and Geoffrey Campbell led a tour through Plymouth’s Burial Hill Cemetery, where graves date back to the 1600s and reports of ghost sightings abound. Massachusetts has been haunted by its history from the Pilgrims’ landing in 1620, to the Salem Witch Trials in 1692, to the start of the Revolutionary War in 1775, and beyond. There’s been strife, revenge, triumph, and everyday tragedy. That’s a lot of ghosts, and some are bound to stick around. In Plymouth, they tend to reside near Burial Hill Cemetery, where graves date back to the early 1600s, says author Darcy H. Lee. The bloodshed sparked by the “shot heard ‘round the world” left its mark on Concord’s Colonial Inn, according to author Joni Mayhan. And in Salem, paranormal journalist and author Sam Baltrusis doesn’t even know where to start. “You can throw a rock down Essex Street, and you’re going to hit a haunted location in Salem,” said Baltrusis, author of an upcoming book exploring the people behind the reputed hauntings. Baltrusis organized the Plymouth Paranormal Convention, where self-described paranormal investigators and authors gathering last month in America’s Hometown shared stories and tips about investigating the dead. What many had in common was a curiosity about local history — particularly the kind that makes the hair on the back of one’s neck stand up. Lee has long been interested in ghost lore of communities around the world. As soon as she arrives at a new travel destination, she makes it a point to head straight to the local book store to pick up a volume about locations said to be haunted in that area. When she didn’t find one specific to Plymouth, she wrote her own and it was published last year. Lee says ghost stories are a window into local culture and history. Some of the most well-known ghost stories of Plymouth rise from the historic burial grounds of early settlers to the area. Burial Hill, located just behind Town Square, has hundreds of gravestones of people who died between the 1600s and the 1930s. Lee said multiple sightings have been reported through the years of full-body apparitions walking up and down the hill, particularly a couple dressed in Victorian attire moving from Summer Street to the cemetery. Many of those reports, said Lee, place the couple at a small, light-colored headstone marked with the name Ida Lizzie Spear, a young girl who passed away at 3 years old. The spirits of 60 dead sailors who froze to death after a ship sailing from Boston to Plymouth Harbor are also said to haunt Burial Hill and the 1749 Court House, where their bodies were first taken. People working in the former court house, which is now a museum, have reported hearing moans of agony and water dripping after sundown, said Geoffrey Campbell, a Plymouth ghost tour guide and Colonial reenactor. Lee and Campbell believe that since people lived in our cities and towns long before current generations arrived, their spirits can remain long after the landscape has changed. “I’m always conscious of place, and what we see right now wasn’t always there,” Lee said. Visitors relaxing on the porch of Concord’s Colonial Inn can forget that the battle at the North Bridge on April 19, 1775 — later memorialized by poet Ralph Waldo Emerson — took place nearby. A team of paranormal investigators and psychic mediums explored the Colonial Inn in 2012 — making sure to write down their observations individually before sharing them with the group. In room 24, said to be especially haunted, four investigators wrote that they “felt” a Revolutionary War soldier with sandy blond hair and a wound on his neck enter the room. And then there’s Salem, which is so packed with costumed apparations every October, you can almost miss the real, and brutal, history. “The weird thing about Salem is they have a love-hate relationship with their ghosts,” said Baltrusis, whose book “Wicked Salem: Exploring Lingering Lore & Legends” is scheduled to come out next spring. Salem is famous for its witch trials of 1692 and 1693, when more than 150 people were prosecuted and 19 were executed. But according to Baltrusis, some of the famed “ghost tours” of spooky Salem get the facts wrong. Many people assume that the accused were, in fact, witches. That is, of course, false, Baltrusis said. Accusing a woman of being a witch was a “misogynistic and patriarchal” way to shame “a woman with a voice,” he said. And the evidence against them was shaky at best. Some authorities accepted “spectral evidence” as grounds for execution; if someone claimed seeing the accused person come to them in a ghostly form, that testimony was often good enough. It is often left out that Andover, not Salem, experienced the largest number of accused witches. And they weren’t all women: Five men were hanged, as well. A misconception also exists that the convicted witches were burned at the stake, Baltrusis said. There were no burnings in 1692. There were, however, 19 hangings and one “pressing” by rocks heavy enough to crush the accused. That pressing was of Giles Corey, husband of Martha Corey, an accused witch who was executed in 1692. Giles defended his wife against the testimony of her two young accusers, and was then himself accused of witchcraft. He was pressed in an effort to force him to plead, and later died in jail. A ghostly women in a white dress who is said to be Giles’s previous wife, Mary Corey, who died in 1684, allegedly haunts Salem’s Charter Street Cemetery, where she is buried. Many mix up Martha and Mary in their ghost stories, Baltrusis said. “Wicked Salem,” available in April 2019, is “about giving a voice to the ghost” by revealing the people behind them, Baltrusis said. Baltrusis spent his early career working as a journalist, and used many of those same research and interviewing skills when he began probing the paranormal.